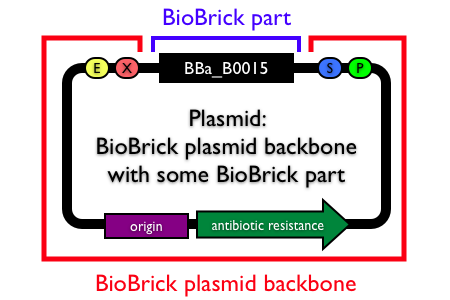 To construct, assemble, or operate BioBrick parts, you are probably looking for a plasmid backbone ... not a plasmid. Please go to the Plasmid backbones collection to see all available plasmid backbones. However, the Registry does have a small collection of plasmids. These are largely legacy parts and not useful for construction of BioBrick parts, devices and systems. However, we include them here for completeness. One of the testbeds for the NSF-funded Synthetic Biology Engineering Research Center (SynBERC) is designing and engineering modules that will be integrated to construct a bacterium capable of moving to and attacking a chemical or biological entity; for example, a tumor or a chemical warfare agent. There are a number of environmental cues that bacteria could use to distinguish a tumor from healthy tissue. The environment is hypoxic and more nutritious, and bacteria grow to significantly higher cell densities (Yu et al., 2003). Components that sense these differences can be linked to genetic circuits that integrate the information. The circuits will activate engineered pathways that control bacterial chemotaxis and the interaction between the bacterium and a mammalian cell. These systems will be engineered into a non-pathogenic E. coli chassis. Chris Anderson, an assistant professor of bioengineering at UC Berekeley and the SynBERC testbed leader, has submitted a set of plasmids associated with his paper on Environmentally Controlled Invasion of Cancer Cells by Engineered Bacteria. Please read the paper for details or contact Chris for details. The Registry also has miscellaneous other plasmids. These plasmids have not undergone Registry curation, but we include them here for completeness.